You probably don’t know what pozole is. I didn’t until recently. In fact I’ll admit that I’m embarrassed at how little I know about Mexican cuisine – despite the fact that I love Mexican-style food so much. Note I’ve used the word ‘style’ because it’s not Mexican food that I’ve always loved, it’s really something else. Call it Tex-Mex, call it what you like but it’s a match made in heaven and sadly the closest thing we’ll get to eating Mexican food outside of Mexico. Corn chips, cheesy dips, anaemic guacamole and Old El Paso packet mixes are about as Mexican as sweet and sour pork is Chinese. And while I absolutely love nachos piled high with cheese and sour cream, it is nothing compared to the life-changing Mexican meal I made last Saturday night. I say life-changing because there were so many culinary doors opened that night. I discovered the secret world of chiles. Not the bombastic hot spice that you shake from a jar – but the nuanced, rich and remarkable flavour hiding inside the dried Guajillo chiles that I rehydrated and mixed with garlic, cloves, cumin and onion to make a paste that forms the basis of the traditional Mexican stew. 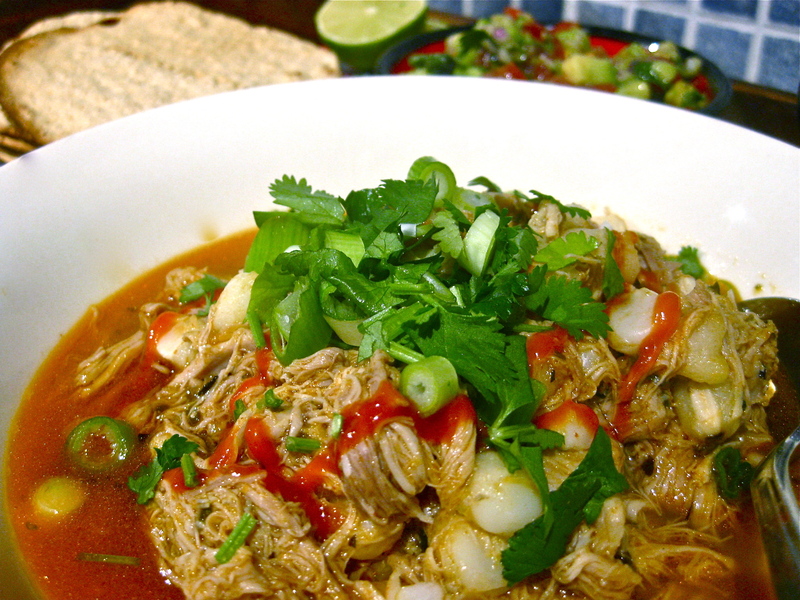 Pozole is an ancient ceremonial dish, made by the people who lived in the area we now know as Mexico. It’s made with chicken or pork, chili paste, hominy and served with lime, lettuce, cabbage or radishes, salsa and topped off with crispy tostadas. Hominy is another old world ingredient that is not widely known about here in the UK, or indeed back home in Australia. Like the old mature peas you find in the split pea packets, hominy is made from dried mature corn grain and is larger, whiter and more flavoursome than the sweet baby corn that we eat straight off the cob. The grains are soaked in a diluted solution of lye which is known as nixtamalisation, a way to treat food using alkalines which not only improves the texture and flavour of the maize but also improves its nutritional value. The process also stabilises the corn allowing it to be made into dough used in tortillas, tostadas and tamales. Before you sniff at yet another example of foolish food tweaking – you might like to know that Aztecs and Mayan’s were rocking this method over 3000 years ago. I always feel a little sheepish when I ‘discover’ food that people have been enjoying for thousands of years. And doubly so in this instance because I know that my pozole experience is just the tip of the tostada (couldn’t resist that, sorry) because I know my repertoire will become so much richer and varied once I familiarise myself with this exciting cuisine. 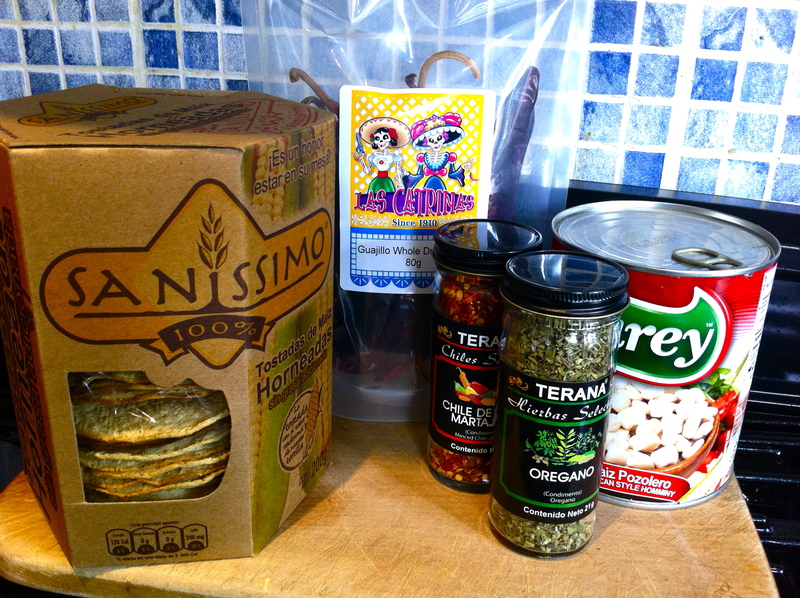 I was able to enjoy my pozole meal thanks to Mexgrocer.co.uk who sent me a pozole kit to try at home. Mexgrocer.co.uk are an online store for authentic Mexican food and they’re set to launch another venture called MexImport.co.uk which will hopefully see the arrival of some proper Mexican ingredients on the shelves of our local supermarkets. In truth, I wasn’t sure if I liked the taste of the hominy in the pot, and I knew that I could have made the stew stronger in flavour but I was easing into the Guajillos – I didn’t want to blow anyone’s head off with chili heat. But once I tried the pozole with it’s intended accompaniment including lime juice, shallots, coriander, crisp lettuce and home-made salsa I was lost for words. I had never eaten a meal with such depth, flavour, palate stimulation, freshness and warmth. Pozole is a thing of beauty and a culinary legacy that the people of Mexico and surrounds should be proud of. I found my recipe online, verified it with several other sites and no doubt I will be tweaking it to be more efficient. This is not for the inexperienced cook, even though it is a simple recipe. There are a few steps and you will have to learn your own best practise in drawing out the most flavour from the chiles and pairing it with the accompaniments of your preference. Do not make the mistake of thinking you can use regular chili powder. If you can’t get your hands on the right ingredients then hit the Mexgrocer website. Recommended listening for this recipe: Feast of Wire by Calexico, Bossa Cubana by Los Zafiros. Simmer the prepared chile, just covered in water for about 10 minutes and allow to cool. In the mean time, bring the chicken, onion, coriander, garlic to the boil. Simmer for about half an hour. Once cooled, get the chicken off the bones and put aside. Keep the broth. Once the chile water is cooled down a bit, put the rehydrated chiles, onion, garlic, cumin, salt, sugar and cloves into a small food processor (or I use a stick blender) and blitz with about half a cup of the chile water. Sieve the mixture into a jug or plate to get a smooth paste. Cook the paste (or use half if you’re worried about too much heat) in a large pot, on low heat for about 5 minutes, to release the flavours a bit more. Then throw in the cooked chicken thighs, about 2 cups of hominy, oregano and the strained broth that you cooked the chicken in. Cook on low for about half an hour to let the flavours develop, the hominy soften and the chicken to cook down further. Simmer until there is not too much liquid left. If you want deeper flavour, cook for longer, topping up with more water. When it’s ready the chicken should be shredded in the stew, the hominy should be soft to eat and the flavours just right. Serve with lime juice, shredded lettuce, radishes, fresh coriander, chopped shallots and home-made guacamole or salsa. The tostadas are optional, as is refried beans – which is one of the typical accompaniments.